Regardless of what you think of the name, these cookies are ones worth a try...especially this time of year when berries are in season! These were part of the cookie spread at the Cookies and Milk baby shower and I kind of figured they'd be the least popular, given that chocolate and peanut butter tend to beat out fruity desserts. 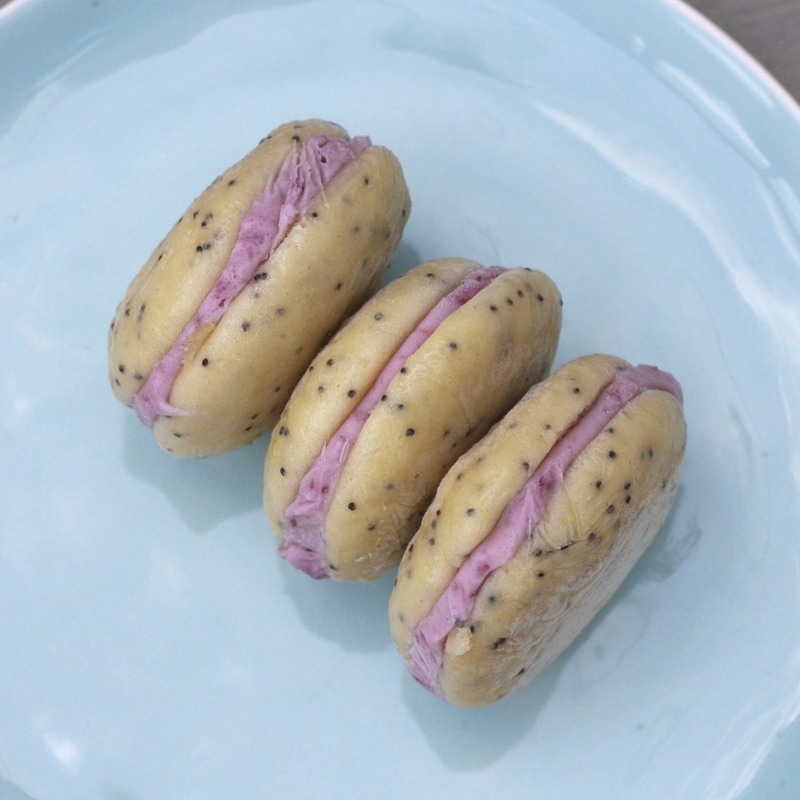 I couldn't have been more wrong though; people flocked to these yellow and purple gems dotted with poppy seeds, oohing and aahing over the bright flavor. The first few times I made gobs, I always ended up with a ton of leftover filling. I knew the same would happen, and the syrup recipe in the book mentioned that it too would have leftovers. I adjusted quantities and ended up with the perfect amount--minimal leftover filling! My adapted recipe is below and makes about 30 filled gobs. 1. Preheat oven to 350F. Line baking sheets with parchment paper and set aside. 2. In a large bowl, sift together flour, baking powder, baking soda, and salt. 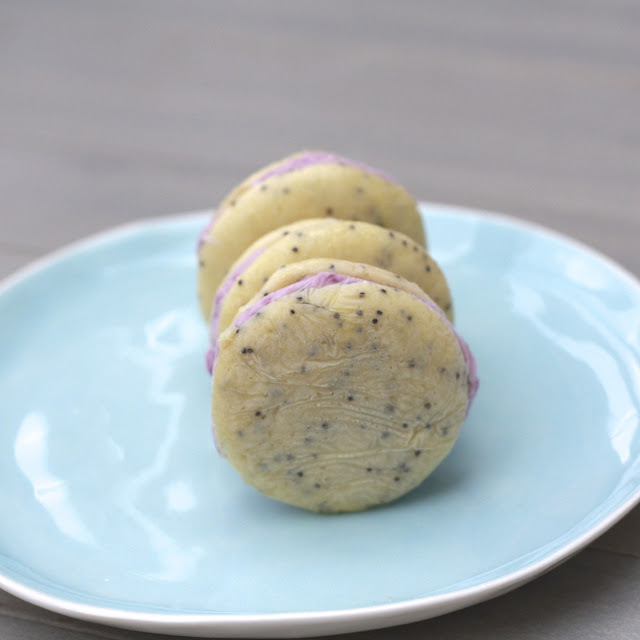 Whisk in poppy seeds. 3. In a separate bowl, cream butter and sugar with a mixer. Add egg yolks, beating after each addition. Beat in egg whites and vanilla. Alternate buttermilk and dry ingredients, beating after each addition. Finally, add the sour cream and mix to combine. 4. Using a tablespoon or a pastry bag (I always use a disposable pastry bag), drop 1 1/2-inch rounds of bater onto the prepared cookie sheets, leaving 1 inch between each. Bake for 8 minutes, or until gob domes have risen slightly (these rose more out than up!). Remove the gobs to cool on a wire rack. 5. To make the filling, you must first make the blueberry syrup. Combine the blueberries, sugar, water, and lemon juice in a saucepan. Bring the mixture to a near boil, then reduce heat to low and simmer, stirring occasionally, until mixture has thickened and reduced. Allow the mixture to cool (can be done ahead of time). 6. To continue making the filling, cream the butter and cream cheese in a mixing bowl. Add the vanilla, lemon juice, blueberry mixture, and confectioners' sugar, mixing on medium. Beat until well-combined. Add an additional tbsp of lemon juice if needed. 7. To frost the gobs, flip the baked gob domes over and add a tbsp of filling to the flat side. Top with a second gob, sandwich-style, and place them on a baking sheet. Refrigerate for 30 minutes, until set, before wrapping each individually in plastic wrap and storing in an airtight container. Gobs can be frozen or kept in the fridge for up to a week.